Once upon a time, I said I'd write a post about the 426 "at some point." 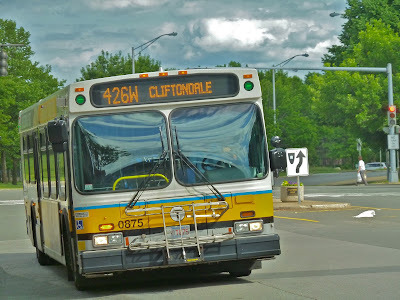 When I said that, however, I had only ridden the 426W, which is the weekend version of the route - it just goes to Wonderland. The full route, which is the weekday version, runs express from Lynn to Haymarket via the Tobin Bridge (woo!). I got the chance to take that version yesterday, so I now feel I can give the 426 the review it deserves. I originally had no intention of taking the 426. I got off at Haymarket and planned to take the first bus that came that wasn't a 111. That happened to be a 426, so I hopped on, along with maybe 20 other people. While we were waiting there (the bus left in 15 minutes or so), many of the riders in front were talking to the driver. They all seemed to be friends, and were happily discussing some of the crazy people that came onto the bus in the past, such as "that woman who wouldn't stop laughing." After two 111's went by within five minutes of each other, both packed to the brim regardless, we set off. Leaving the busway, we looped around the I-93 portal and headed up North Washington Street, soon becoming the Charlestown Bridge. The TD Garden was in view to the left, and to the right was Boston Harbor. On the other side, there were two more 111's bunching, and both were still sardine cans. 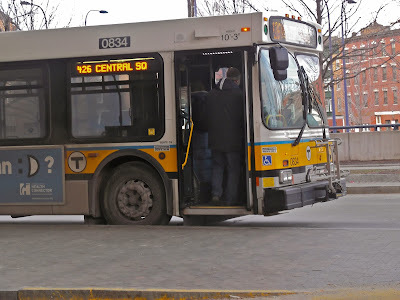 But whereas the 111 makes stops along this local portion in Boston, the 426 plows right through, or as close as you can get to plowing right through when contending with large amounts of city traffic. A decent picture of the 426 at Haymarket. We soon turned off and headed for the Tobin Bridge on an exit ramp through the industrial wasteland below I-93. There is a feeble attempt to spruce up the place with some public art - different colored streetlights. Rather than making a gross area look nice, it more just looks really out of place. Nice idea, though. We soon got into a tunnel and the driver gunned the motor. And when the road surfaced to become the Tobin Bridge, the driver floored it like buses always do when running express. To the left is industrial wasteland, and to the right is a great view of hundreds of packed apartments and the Mystic River. The 111 turns off once crossing over the river, but the 426 keeps going on Route 1, which soon runs at ground level. The highway makes some sharp turns, with apartments (and soon just houses) easily in view. We got off at the Route 60 exit and went around the massive rotary by the Northgate Shopping Center. There's a big lake in view (Rumney Marsh), and a massive traffic jam going onto Route 1 away from Boston, believe it or not. We turned off onto Squire Road, and there were about 5 or 6 people who got on at the Linden Square stop. We soon turned onto Lynn Street, leaving behind the industrial-ish neighborhood around Northgate for a much more residential area. Once we went under Route 1, there's a small park and then it gets residential again. We went by a very run down basketball court (where one person was shooting hoops), and soon reached Cliftondale Square, Saugus, where there are some businesses and a much smaller rotary. Lincoln Ave, the street we traveled on, curves right at the rotary, and it gets residential again with the occasional shop. Lincoln Ave goes on a bridge over a river, with swampland in view. Lincoln Street becomes Boston Street and we entered Lynn. In this particular neighborhood, there's a gas station, a liquor store, and a pizza joint. Classy. A bad, blurry picture of the 426 in Lynn. A woman got in the way of the bus, as well. It gets residential again after, and we turned onto Summer Street. The bus got pretty crowded by this point, with a few standees. A nice guy wearing ratty clothes and sipping out of a Dunkin' Donuts coffee cup sat next to me and told an amusing story of how a crazy 60-year-old woman came into the 426 with no pants on, definitely trumping the story about the laughing woman. This route seems to attract a lot of crazies. There is another swampy view before the bus goes through an industrial warehouse area. Soon after, we turned onto Western Ave, joining up with a multitude of other buses. There are many more businesses here, which range from Walgreens to Dunkin' Donuts again. We soon turned again onto the very wide Market Square, with Lynn Common in the middle. Looking at my schedule, I noticed that for our trip and others, it said "Arrives 4-5 minutes earlier at Silsbee Street/Greater Lynn Senior Services." I wasn't sure what this meant, so I asked the guy next to me. He said it just meant the bus makes a loop in downtown Lynn. The way it was worded, I thought it meant the bus was going to an entirely different destination! The buildings got much taller as we turned onto Market Street. We soon pulled into the Lynn busway, and everyone but a few people (including the guy sitting next to me) got off. Now, a note about the 426W. It follows the same route from Lynn down to the big rotary by Route 1, where it goes down Squire Road. After Northgate (which it doesn't pull into, unlike a few other buses), it actually becomes the only one on Squire Road, though it doesn't make any stops. 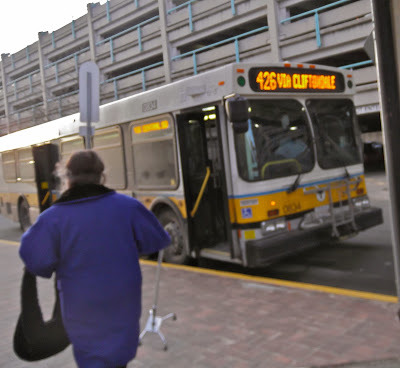 It goes through the industrial-ish area of Revere that I really don't like, joining up with some other buses at Brown Circle (another rotary). It heads down American Legion Highway until Bell Circle (there are a lot of rotaries on this route), where it goes onto VFW Parkway and pulls into the Wonderland Busway. Unfortunately, the best picture of the three is of the short, weekend version of the route. Ridership: For a route of this caliber, I was very surprised at the number of riders. About 45 people or so rode the 426, half of which using the local portion from Linden Square to Lynn. As for the 426W, I don't entirely remember the ridership, but I want to say around 20-25 people rode, which isn't bad. Many of the people who rode on the 426 had grocery bags and the like, so they seemed to be using it as a way to get their shopping done. Cons: The scheduling for this route is so insane! Some trips start at the Lynn garage. Some trips end at the Lynn garage. Some trips serve Bell Circle. Some trips don't make the loop in Lynn. One trip in the morning starts at Linden Square. Some trips start at "O'Callaghan Way," wherever that is. And of course there's the weekend routing to Wonderland. The guy who sat next to me said that he sometimes ends up on a bus to Lynn Garage without knowing it, and when they kick him off he's stuck in the middle of nowhere and has to walk to his destination. The schedule makes absolutely no sense. Nearby and Noteworthy: Nope, sorry. Frankly, none of the neighborhoods the bus went through seemed that nice, but that's just me. It's a nice, quick way of getting to Lynn (not that I would want to for any practical reason, but that's besides the point), and it seems to be well-used for every hour-or-so service. I'm not really a fan of the weekend version, or the sheer multitude of service variations in general, but I really like that ride over the Tobin Bridge. Plus, we got to Linden Square in 15 minutes! Imagine how much longer it would take to take the train, and then a local bus to get there. Of course, there wasn't any traffic on Route 1 when we rode, so it may be a pain at rush hour. Midday, though, it's great.